Where should my Cart be located? Carts should be located in a public place, but it doesn’t have to be one frequented by artists, this is a way of putting creative materials in the hands of everyone so think outside of the box. Your local coffee shop may be the perfect fit, but a dentist office could work too. The important thing is that it is in a place where people can access it and someone is looking after it. Make sure you have permission from the location to set up a cart and determine who is responsible for it. The idea is for carts to have a life of their own, with people using and contributing materials that will keep it replenished and ever changing, however it will need to be tidied up from time to time and possibly restocked. Does a Cart have to be a particular size? A Community Art Cart can be any size. It can be a five foot shelf with wheels, built-out to accommodate a variety of materials or it can be a modest box that sits on a counter. It would be great if it is reused item. You can paint it to make it more fun or give it a theme, the cart itself can have an identity or just be a place to house materials. What kind of materials should be on the Cart and where should they come from? This is where it gets fun! The main idea is for the materials to be reused from other sources, that could be your old stash of watercolor materials that no longer gets used or your neighbor’s yarn collection. Again, the idea is for carts to function on a give and take basis, but they need to start with some stuff. Soliciting materials is a great way to get started, you can ask friends or neighbors to contribute stuff or take it into the community, discarded office supplies can be great for crafting so seek out local offices for materials that may otherwise be heading for a landfill. Perhaps a local thrift store would be willing to make a contribution or sell items at a reduced rate. Materials can be a mix of items that could be used for any creative purpose or you can work with a theme, a yarn or paper exchange; depending on where the cart is located and how much space you have. Materials should be in good condition and ready for a new life. Materials should be safe and appropriate for the environment they will be located in, no knitting needles in the children’s department of the library! This is another important responsibility of the Cart’s host, to monitor materials being contributed for safety and appropriateness. Crafting: Molds, pipe cleaners, googly eyes, pom-poms, marbles, pins, board games/puzzles, jewelry, yarn, embroidery thread, foamcore, posterboard, matboard, frames, vinyl lettering, photo albums. Paper: Copy paper, letterhead, construction paper, cardstock, art paper and pads, origami paper, posters. Collage & Scrapbooking: Stickers, scrapbook paper, rubber stamps and stamp pads, calendars, playing cards, postcards, maps. Fabric and Notions: Fabric, fringe, cording, laces, lace, elastic, zippers, bobbins, thread, buttons, beads, sewing tools, ribbon, Velcro, fasteners, leather, felt, patterns. Office Supplies: Manila/hanging/accordion folders, binders, post-its, paperclips, bull-clips, writing utensils,hole-punches, organizers, transparencies, sheet protectors, labels, envelopes, tape, notebooks, clipboards. Party & Gift Supplies: Tissue paper, greeting cards, party decorations, ribbons, bows, rolls of gift wrap, gift bags. Vintage: Stamps, maps, postcards, office supplies, books, papers, newspapers, ephemera. Why should I start a Cart? If you are looking at this site you probably have some interest in creative activity, maybe you don’t consider yourself an artist, maybe it is your profession, in either case your interest in creativity can be an inspiration to others through a Community Art Cart. Creating an opportunity for people to encounter free, playful materials is an awesome way to support creativity and sustainability. Remember these carts don’t have to be for artists they are a way of making creative materials accessible for everyone. Put your Cart on the Map! 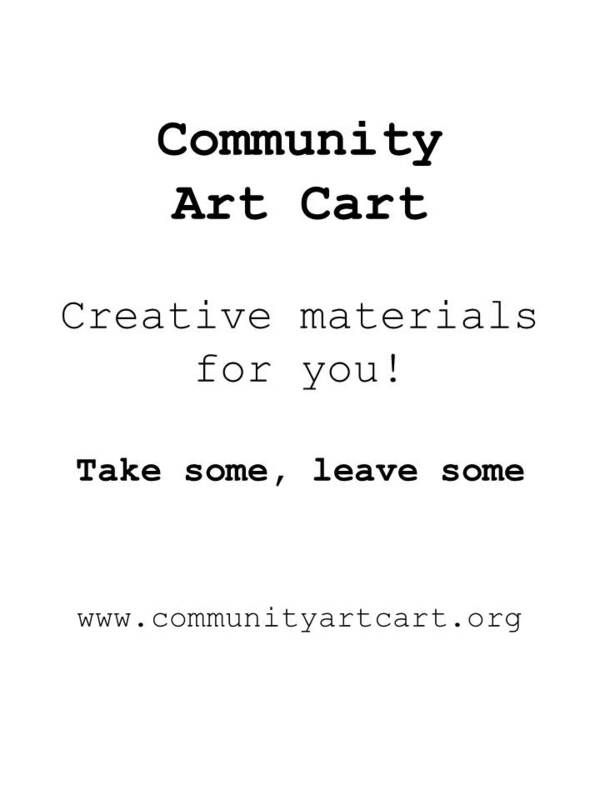 Once your cart is established E-mail, info.communityartcart@gmail.com with its location to help people find it, here!